He came home last evening looking like this . . . . .
“Did you use a chainsaw today?” I asked, thinking he may be developing my father-in-law’s habit of ripping up his pants every time he picks up a chainsaw. A police officer pulled Sid because the sticker on his trailer was outdated. Sid searched the glove compartment, found the new up-to-date sticker and showed it to the officer. At the officer’s suggestion, Sid got out of the truck to slap on the new sticker lest he get pulled again on the way home. When he was walking by the trailer, his pants got caught on the side and ripped. Oh well, atleast it was just pants. It’s not like it was a chip off the ol’ shin bone. That one hurts me every time I look at it. You can actually see the dent in the bone just under the skin. Thankfully, most of his bang-ups heal eventually, without noticeable long-lasting effects. Cuts, scrapes, blood, ripped clothes —- these sorts of things are a regular occurrence with this man. All his clothes are ripped and torn. It is one reason he rarely buys new clothes. Within a few days, new clothes look like old clothes anyway. I don’t mind the dirty, torn clothes. I actually kind of like it. 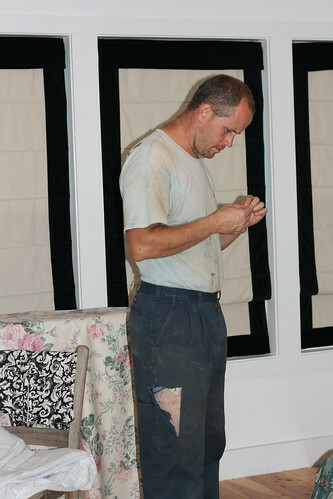 There is something about a man in dirty, torn clothes because he has been working hard for his family. The blood and bone dents are another thing altogether. I don’t like those all that much.